Climate 9 outside Aberdeen Crown Court June 14, 2010 on trial for vandalism, say the real crime is ecocide, not peaceful campaigning against airport expansion. 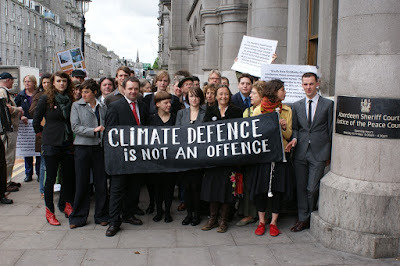 This is Scotland’s first ever major climate change trial, a group of climate change activists facing charges of Beach of the Peace and Vandalism after closing down Aberdeen Airport in March 2009. The two week trial starts in Aberdeen Crown Court today. At 3am on the morning of March 3, 2009, 9 friends stood up for what they believed in and occupied a taxiway at Aberdeen Airport, building a wire enclosure containing a miniature golf course while two activists occupied the roof of the main terminal building. They wore clothes parodying Donald Trump and displayed a banner reading 'Plane Stupid Golf Open 2009'. Their action was designed to stop carbon emissions from aviation and to highlight the links between Donald Trump’s planned hotel and golf course complex and the expansion of Aberdeen airport. The Climate 9 are arguing the defence of necessity. They argue that their actions were justified because people should be allowed to peacefully take action on the biggest threat facing humanity in the face of government failure and a huge democratic deficit in taking the action necessary to stop runaway climate change. The aviation industry uses more fossil fuel than any other industry, which directly contributes to the damage, destruction to and loss of ecosystems. The knock on impact affects the whole global community; not just today’s but tomorrow. To stand up and ask for it to stop is a call for intergenerational justice. It is a call for ecological justice. What do the aviation industry want? They want to expand their services and for people who object to be imprisoned. What do Climate 9 want? They want the courts to drop all charges against the climate 9 and instead pursue climate criminals such as BAA, who are getting away with ecocide, causing death and destruction in poor countries and misery for local people living near their Airports. As they rightly point out, most flight destinations can easily be reached by bus, rail and ferry. They want to stop unnecessary short haul flights and airport expansion, stop aviation advertising, and take steps that ensure a just transition to sustainable jobs and transport. They want the police and the aviation industry to be as open, honest and accountable as they are, to stop scare tactics, lies and intimidation and start listening to people concerned about climate change. They want they UK government to stop sponsoring the aviation industry, currently subsidised by the UK taxpayer for £9 Billion a year, subsidies that benefit the wealthiest and that could be used for sustainable transport projects. 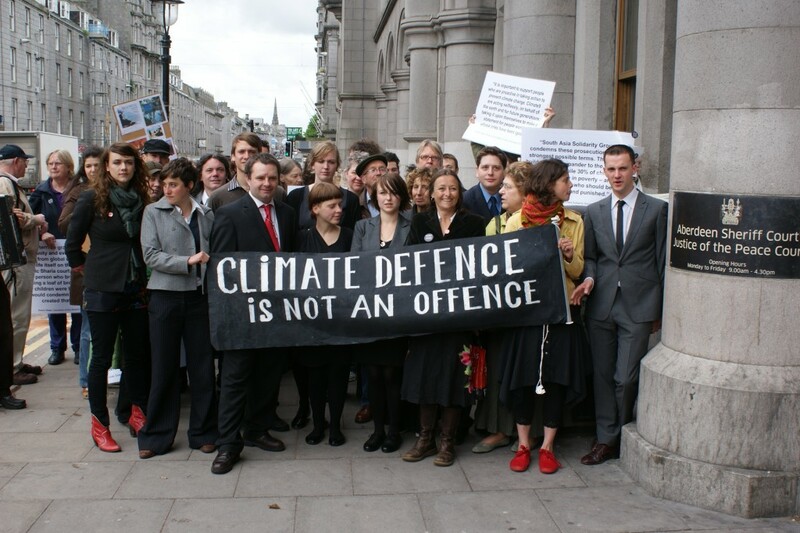 If Climate 9 are aquitted, it will be the first time that the defence of necessity will have been successful in Scotland in a case involving activism. This is a stand for eco-justice. The Climate 9 who stand in the dock represent the millions of people throughout the world affected by climate change. They are Jimmy Kerr, Josie Hanson, Bill Boggia, Dan Glass, Mark Andrews, Tilly Gifford, Mila Karwowska, Kate Mackay and Johnny Agnew. Errrmmm.. I don't think so. There are no Crown Courts in Scotland! The group was tried in Aberdeen Sheriff Court with a jury (15 in Scotland, not 12) under the "Sheriff solemn Court procedure".